Tama SLP Drum Kit 5 Drums "Studio Maple" in Gloss Sienna - 22x16BD, 10x7TT, 12x8TT, 14x14FT, 16x16FT & MTH1000 Double Tom Holder. 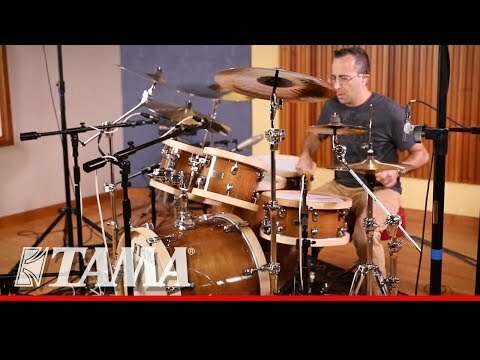 The Tama Studio Maple kit is a very original model in both sound and appearance, with Sound Focus Rings on the inside of the shells and 100% Maple Wood Hoops. It has a focused, warm, woody tone with clear attack, and a relatively short sustain with beautiful decay. While great for live performance, this model really excels in the studio, especially when seeking a warm sound with controlled resonance. The 22 mm thick hoops provides warm sound and powerful attack especially rim shot. Note: Snare Drum, Cymbals and Stands not included.